Are your kids famished when they get home from school? Kids often hit the kitchen right when they get home and begin the search for something to eat. After being at school all day, it’s inevitable they will bring a host of germs into the house (and into the kitchen). These germs, or microorganisms, can contaminate your kitchen and make your child sick if they are not kept in check. How can kids prepare after-school snacks in the safest way? Keep all items such as books, backpacks, and sporting equipment on the floor and off of kitchen counters and tables. Wash hands first when coming home from school, and again before making and eating a snack. Hands carry lots of germs and can easily contaminate everything they come in contact with. 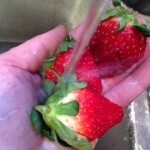 Wash fruits and vegetables under running water before eating them. What are some good after-school snacks? Choosing easy and healthy snacks for kids can be a real challenge, especially when dealing with picky eaters. Typically, kids feel more independent when they have options and can control what they eat. Parents can set their children up for success by having a variety of healthy snack choices that are easily accessible. Find some great snacking ideas here. Keith Williams, PhD, director of the feeding clinic at the Penn State Hershey Children’s Hospital, recommends having plenty of fruits and vegetables already washed, cut up, and within easy reach of children. Keep the “sometimes” foods out of reach so you can control when your child eats them. “The goal is to make it easier to obtain the healthy snacks you want your child to eat and more difficult to obtain the foods you don’t want him to eat,” says Williams. Read more about “Breaking Your Gradeschooler’s Unhealthy Food Habit” here.